Baoji-Lanzhou High Speed Railway is due to open on July 9th, 2017. By way of this new line, the north west China provinces and regions including Gansu, Qinghai and Xinjiang Uighur Autonomous Region are expected to completely integrate into the rapidly developing high speed railway network of the country. Trains running on or by way of Baoji-Lanzhou High Speed Railway accept reservation at 16:00 on July 6th, 2017. The 401-kilometer-long Baoji-Lanzhou High Speed Railway starts from Baoji City of Shaanxi Province, via Tianshui City, Qin'an County, Tongwei County, Dingxi City and ends at Lanzhou City of Gansu Province. It has 8 stops along the way, naming Baoji South Station, Dongcha Station, Tianshui South Station, Qin'an Station, Tongwei Station, Dingxi North Station, Yuzhong Station and Lanzhou West Station. It has a designated speed of 250 kilometers per hour. Construction work on Baoji-Lanzhou High Speed Railway was started in the end of year 2012. In March 2017, work on integration test and commissioning (ITC) was commenced. Initially, 42 pairs of EMU trains are assigned on the railway line. Train Travel time is about 2 hours from Baoji to Lanzhou or 3 hours from Xi'an to Lanzhou. Connecting with Xi'an-Baoji High Speed Railway to the east and Lanzhou-Urumqi High Speed Railway to the west, Baoji-Lanzhou High Speed Railway is the western section of Xuzhou-Lanzhou High Speed Railway which is an important railway line in China National "Eight Vertical and Eight Horizontal" high speed railway network. Besides of Baoji-Lanzhou High Speed Railway, Xuzhou-Lanzhou High Speed Railway is composed of Xuzhou-Zhengzhou High Speed Railway, Zhengzhou-Xi'an High Speed Railway and Xi'an-Baoji High Speed Railway that have already been in operation. 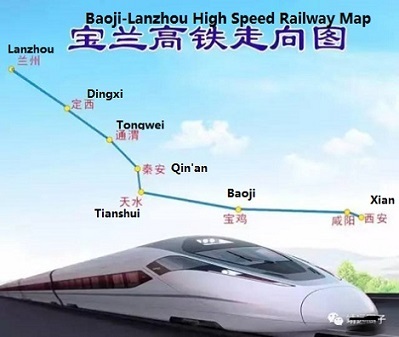 The opening of Baoji-Lanzhou High Speed Railway comes up with the full operation of Xuzhou-Lanzhou High Speed Railway which connects the East China, the Central China and the Northwest China together. Tourist Attractions along Baoji-Lanzhou High Speed Railway are Baoji Famen Temple, Tianshui Maijishan Grottoes, Qin'an Dadiwan Site, Tongwei Qinjia & Xushu Park and Lanzhou Yellow River Mother Sculpture.